U.K. consumers group Gamers' Voice has filed a formal complaint over an episode of The Wright Stuff that used footage from Modern Warfare 2 while attempting to draw links between violent videogames and a real-life gang killing. 16-year-old Agnes Sina-Inakoju was by all reports a promising student who hoped to study at Oxford before she was gunned down by a pair of scumbags while ordering a slice of pizza. The duo, both of whom were recently jailed for life, apparently assumed that members of a rival street gang would be hanging around inside the pizza shop when they opened fire, so they didn't bother checking to see who they were actually shooting at. That sad incident was the focus of a recent episode of daytime television talk-show The Wright Stuff, but instead of looking at socio-economic factors or the influence of gun culture, the show apparently went for the easy mark: violent videogames. 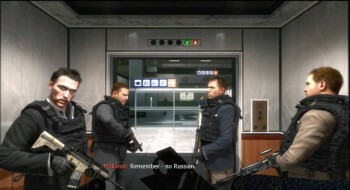 Video from the Modern Warfare 2 mission "No Russian" depicting a terrorist massacre of Russian civilians was used to introduce the segment, while Daily Mail columnist and regular Wright Stuff panelist Anne Diamond said violent games were obviously to blame for causing violent behavior, and that reports claiming otherwise should be ignored because they're "obviously" funded by the games industry and thus completely biased. "We don't really need reports to tell us [that violent video games cause anti social behavior] do we?" she asked. "Common sense tells you if you expose a child to violent imagery and a lot of it for many hours a day for many years on end, it's going to have an effect." Rather than "sinking to the same level as Anne Diamond" by calling people names on the internet, Gamers' Voice called on gamers to respond "eloquently and intellectually." To that end it filed a formal complaint with broadcaster Channel 5 protesting both the "unbalanced content" of the show and the "inexplicable" use of footage from an 18-rated game on a daytime television show. "Apparently at 10.30 in the morning during the school holidays, it's fine to show scenes from an 18 rated game to set context of how it causes violence," the group wrote, "which goes in some way the level ignorance of all involved in the program on the subject being discussed."